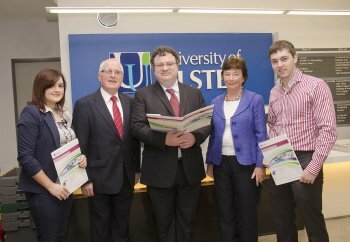 Employment and Learning Minister, Dr Stephen Farry, has been briefed on a unique University of Ulster internship programme, during a breakfast meeting today (Wednesday October 3) at the Belfast campus. The Minister joined employers and students to hear details about the innovative Professional Experience Programme (PEP), which offers top quality graduates a placement opportunity, complete with a £5,750 bursary. PEP provides a six-month internship with a local employer as well as a Graduate Certificate in Professional Practice. Minister Farry said: “I am pleased to see how programmes such as the Professional Experience Programme can be extremely successful, in not only promoting the employability prospects of graduates but also emphasising the importance of lifelong learning. “The role of the business sector in Northern Ireland in providing meaningful internships and work placement opportunities cannot be underestimated. The University currently invests £180,000 per year in PEP, which reflects its commitment to both enhancing the employability of graduates and supporting them as they enter a job market with stiff competition for work prospects. More than 20 businesses have joined up to the Programme and each is required to monitor and support their chosen participant, as well as contribute £2,950 (plus VAT) towards their fees and a portion of the bursary. The University’s Career Development Centre helps individuals to secure their placement, matching them with suitable employers who are looking for graduates from a wide range of disciplines. Participants in the Programme cover areas such as employability, managing personnel relationships within organisations and living and learning in networked communities, where the main focus is the role social media plays in the workplace. During their internship they must complete a project, identified by their employer, which examines the quality improvement of a key business element within the organisation. In order to provide a balance between study and employment, participants only need to attend a few on-campus workshops as the majority of learning takes place online, providing an interaction with other graduate interns and University staff. As well as providing academic supervision, University staff visit each graduate in their workplace on three separate occasions, meeting up with the Internship Supervisor to discuss progress. Professor Anne Moran, Pro-Vice-Chancellor (Educational Partnerships and International Affairs) said: “The Professional Experience Programme is an excellent chance for Ulster graduates to enhance their employability. Alissa Kleist, an MA Fine Art graduate who gained her Certificate in Professional Practice in July, spent her internship with Belfast Exposed Photography. She said she joined the Professional Experience Programme to gain practical skills and experience in her field of work. “Jobs are often scarce in the arts sector so it was a real bonus to be taken on and employed by an organisation like Belfast Exposed, which has such a great reputation,” explained Alissa. “For recent graduates, finding employment after finishing their degree is often really hard so it was an added bonus to be paid for doing a job I really enjoyed and to gain experience at the same time.